Today, Wizards of the Coast announced the newest Dungeons & Dragons storyline and accompanying product offerings for both digital and tabletop RPG players. 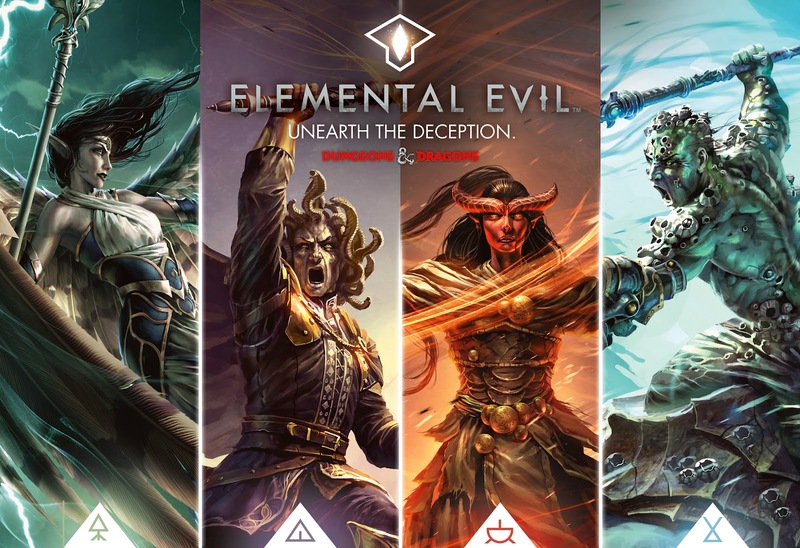 Coming off of the biggest and most exciting year yet for Dungeons & Dragons, the Elemental Evil storyline starts in March and runs through mid-summer. During that time, heroes are needed in the Forgotten Realms to discover and defeat secret cults that threaten to annihilate the Sword Coast by harnessing the powers of the elements of fire, water, air, and earth. The product line-up includes the release of a new downloadable module—Neverwinter: Elemental Evil—for the highly acclaimed free-to-play Dungeons & Dragons MMORPG from Cryptic Studios and Perfect World Entertainment. Serving as an additional way for fans to experience the storyline, Neverwinter: Elemental Evil brings a new playable class—the Paladin—and increases the game’s level cap to 70. Neverwinter is set in the Forgotten Realms, and the new expansion launches in early 2015. Cryptic also recently announced Neverwinter on Xbox One will be available in early 2015 as well. Characters in the D&D tabletop roleplaying game can help prevent devastation to the lands and people of the Forgotten Realms in the Princes of the Apocalypse adventure by Wizards of the Coast and Sasquatch Game Studio.Princes of the Apocalypse is available on April 7, 2015 and includes an epic adventure for characters levels 1 – 15 as well as new elemental spells and the element-touched genasi as a new playable race. In addition, a free download will be available in mid-March that includes more new races plus the player content available in Princes of the Apocalypse, just in time for the start of the Elemental Evil season of the D&D Adventurers League. Other products tied into the Elemental Evil storyline include the Temple of Elemental Evil Adventure System Board Game and pre-painted collectible miniatures, both from WizKids Games. WizKids has also partnered with Perfect World Entertainment to bundle in-game items for Neverwinter with the Temple of Elemental Evil Adventure System Board Game and miniatures boosters. Rounding out the tabletop RPG game products is Gale Force Nine’s new Dungeon Master’s screen featuring Elemental Evil art, as well as unpainted, resin miniatures that tie into the adventure, all slated to release beginning in March. Learn more about the Elemental Evil story by visiting DungeonsandDragons.com or by following D&D on Facebook, Twitter, Tumblr, Pinterest and YouTube.